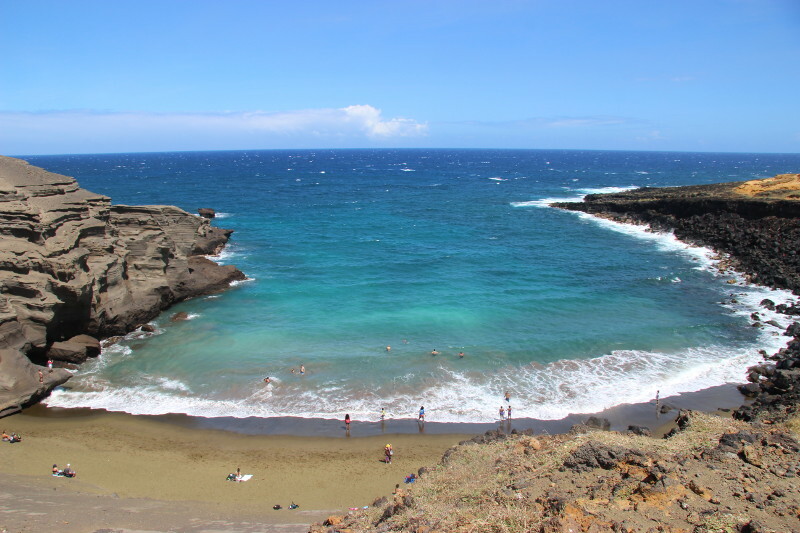 We visited Green Sands again. We love the place. Is it worth the drive? Only if you have a four wheel drive with great clearance. I would not hike the 3 miles in, as there isn't any shade, it can be very windy, and it is dusty. There are also no bathrooms or drinking water, so be prepared. But we do see people hiking. It isn't a difficult hike, just hot and windy. Bill says he wouldn't hike in either. There are prettier hikes on Hawaii and much easier beaches to get to; but if you just love to hike, the destination is great. Wear good shoes. This day there were a group of locals stopping and discouraging people from driving in, and encouraging them to pay $15 to stand in the back of their pickup, so they could and drive them to the beach and back. I have no idea if that was a one way fare or both ways. The young couple from Italy who we offered a ride to on the way out, said it took them a little over an hour to hike in. Note: They had rented a car that could have driven it, but were stopped by locals and told they couldn't drive in. By the way, there isn't any parking fees. I think it is much safer to walk than to ride standing in the back of a truck. 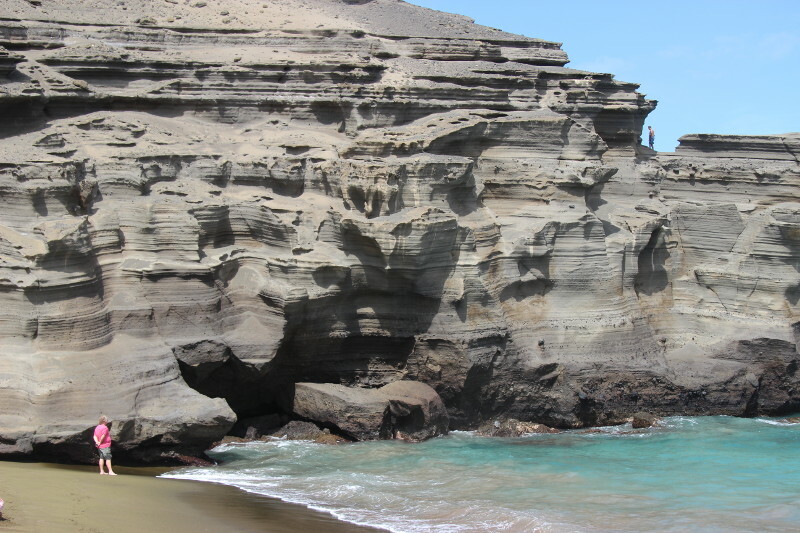 Here is a picture of the area from Green Sands looking back the way we came. You decide. Tracks coming into Green Sands. No those aren't walking trails, because there aren't any, you just choose the car path and keep the ocean on your right. It is difficult to understand the scale in the photo. Each path is as wide as a car or wider, and some are as a deep as a car or deeper. Not of the faint of heart, the road is rough, and difficult to decide which path is better (it isn't obvious and I'm sure always changing). It took us about 30 minutes to drive in and another 30 to drive out. It is expensive if they have to haul your vehicle out. But after you get there here is the rewarding view from above. And after an interesting climb down the right side, you'll arrive on the medium-light, hint-of-green beach. 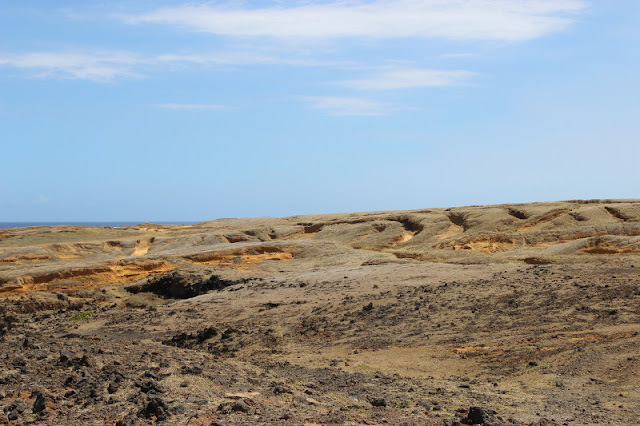 The green is from the olivine crystals washed out of the volcanic rock and cinder. Once you learn to recognize it you'll see it at some other beaches on the island, just not in this quantity. Bill looking at a turtle swimming in the surf. Last time there we snorkeled, but I don't think it is worth bringing the gear. This is more about building sand castles, playing in the waves, and taking photos. We'll go back, I forgot closeup photos of the sand. This is what I call glitter therapy. Get wet, role in the sand, and then take a video with the sun at the camera person's back. You'll sparkle. Then wash off well in the wave before heading home, because you can't take that any sand from any beach in Hawaii. Ha. Good luck.